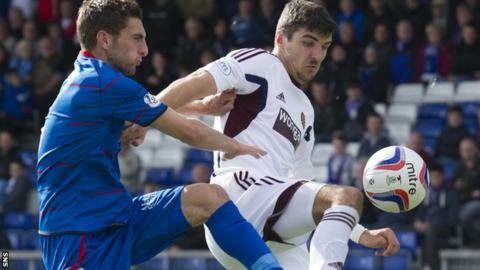 Inverness fans said the Scottish Professional Football League pledged to help with travel plans. SPFL chief executive Neil Doncaster said stadium capacity was one of a number of factors in their decision. David Balfour, Caley Jags Together chairman, said league representatives promised to use their influence to secure better travel arrangements to the game for Inverness supporters. "It is difficult to be too disappointed in that we are the first fans organisation I think that the SPFL have actually listened to," Balfour told BBC Scotland. "We have had to go in there and try to do things in a spirit of cooperation, which I think we've done. "We'll see what happens when we talk about the transport options and things that the SPFL say that they are going to assist us in sourcing. "We will withhold judgement until that actually happens." Inverness chairman Kenny Cameron had also criticised the arrangements for the match, with the kick-off making it impossible for his club's fans to reach Edinburgh by public transport in time. "I think the SPFL have been taken aback by the avalanche of pretty poor publicity that they've had over this topic," added Balfour. "I don't think they'll be doing this to us again, put it that way. "I think the Highlanders have shown that they can stand up for themselves and that we're not just a wee club. "We are there for the long-term and they better get used to us being there." Doncaster said the Cup tie would be played at Easter Road for a variety of reasons. "Travel is one of a significant number of factors considered when arranging such fixtures and we are, of course, sympathetic to the unique challenges faced by the Inverness supporters," the SPFL chief executive explained. "However, other issues such as stadium capacity and facilities, the respective sizes of support which teams will bring and the requirements of broadcasters all have to be considered. "The added complication this year, of course, is that Hampden is out of commission due to construction work for the Commonwealth Games. "We have pledged to approach the transport authorities to examine whether there are any steps that can be taken to alleviate the challenges faced by the Inverness fans for the match at Easter Road and will be back in touch with Mr Balfour as soon as possible. "We are looking forward to two cracking semi-finals."